Well it's not today but it's coming up in a few days and, as with all occasions in my life - birthdays, anniversaries etc. I always think that, if you sit quietly and hope people remember then you might be disappointed whereas if you bang on about it for a few days beforehand, you tend to get a happier result. Ironically I started my blog on 1 April so my blogaversary will always easy enough to remember. More fool me. So what are we going to do on the day? Well a giveaway is of course in order but you have to tune back in on the day for details of that. What I can say is that I am planning a regular first of the month linky party called "Fresh Sewing Day". Every first of the month a new post will allow you to link to your favourite project of that month. It could be some fabulous fabric you bought, it could be a finished quilt and it could be anything in between. Sometimes we have projects that aren't being featured in Flickr bees and swaps and it's a chance to show those projects off to a few more people and get a few extra visitors to your blog. It might also be a chance to win a feature post on my blog and it might also be a chance to win some fabric. Who knows. Fresh Sewing Day is going to be sponsored each month by Sew Fresh Fabrics. Wanna grab their button? Well here it is and let's just say that having their button on your blog could well confer an advantage in future giveaways on Fresh Sewing Day...! What will I be showing you on the first of the month? 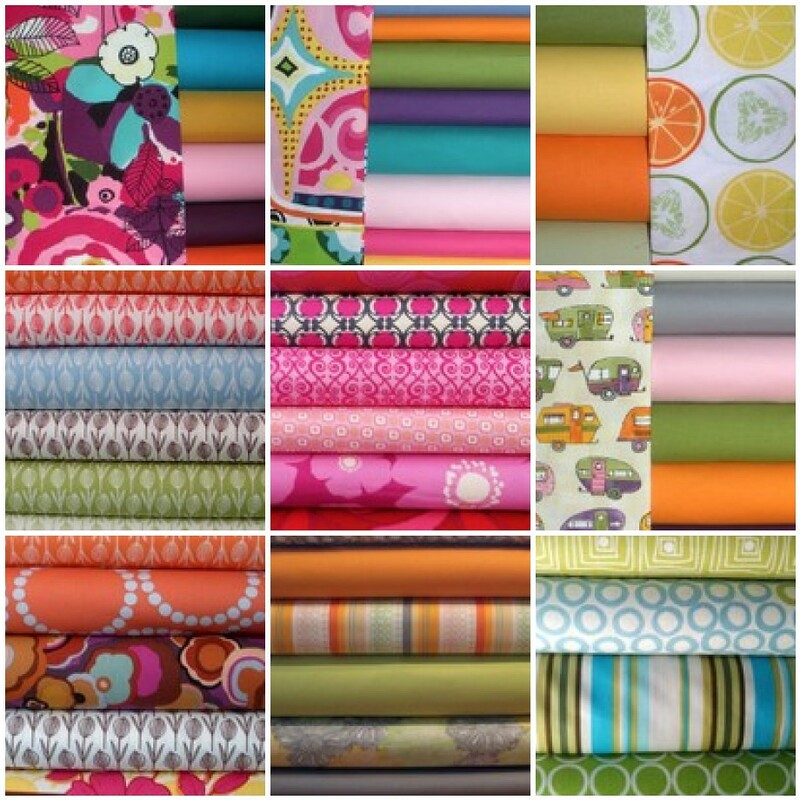 Well, I will be showing off my new favourite fabric bundle, brought to you each month by Sew Fresh Fabrics. Which bundle am I going to choose this month? Eep, it's not as easy as you'd think. Here are a few of my favourites but which would you choose? Will you get a chance to pick one of these for yourself on 1 April? You'll have to tune back in to find out! Can I get in early and congratulate you? Happy Blogaversary! I love that cute caravan print...and yummy colours. Grabbing and adding button now! What a fun idea Lynne! I can't pick just one either all those bundles look great. ooh, those wild thyme pods are so gorgeous! Dear Lynne! I'm in love with all these combos you create! I'ts impossible to decide! And in the first hour of 1th April I will be here to congratulate you! For some odd reason I really drawn to the greens in the bottom right corner...maybe it is the spring-yness of them?! Sounds like lots of fun and excitement ahead for us all! Great idea Lynne, love the caravan fabric! Happy almost blogaversary - I see some purple fabric in there - I love purples. Early happies. I love the top middle and the caravan fabric, but they're all lovely. Your new plans sound like fun. And I love these fabrics. The choice is hard but I think I'd go for the lime and aqua in the bottom right corner. Happy Blogaversary for April 1st! Nice bundles :-) I do like the campervan print with the funky solids. I like you. I can appreciate a person who knows that she likes a little attention and puts that out to the universe. That's a much better approach than craving it secretly and ending up disappointed. :-) Happy blogaversary! I`ll wait until the 1st to congratulate you but in the meantime, I`m loving the acqua and green stash...button added! I think all birthdays and anniversaries and special occasions should be celebrated over time!!! I know I celebrate my birthday month!!! hehehe I am so delighted you decided to blog. I enjoy it! And I love any and all of those fabrics. What a wonderful idea! Congratulations!! WAY back in '97, my son gave me an old puter he had - said he thot I might like to noodle around on it. HA! I first turned it on April 1, 97 - and yes, more fool I. *L* I can't think of a day I've not turned on some kind of puter since. Happy early Blogaversary to you. Love the fresh lemon/limes and solids...so pretty...I am so ready for Spring! Yay for blogaversaries! Come to think of it, I can't even remember when I started mine. I love all those prints. I bought the "everything but the kitchen sink" bundle for DQS10 but didn't end up using it. Darn. More fabric for me. I have to say if I had my choice I would go for the wild thyme. I just love all those colors and the print goes nicely with so many others. Happy Blog-a-versary,and I don't think you are an April Fool at all. I love all those fabrics. Such beautiful colors! Congrast on the blogiversary! I just started my blog so it will really feel like a milestone when mine comes around. I would choose the top row middle one. Love those colors together. The fresh sewing day sounds fun and I grabbed the Sew Fresh Fabrics button. Have a great weekend! I'm the same way - I LOVE my birthday so I do a birthday countdown that starts about a month ahead of time (one month today is my birthday! ), then shifts to weeks (two weeks left til my day!) then days etc. etc. My husband just rolls his eyes but it keeps me amused. One has to do what one can to stay entertained, no? What a beautiful collection! I'm drooling here. Love those little vintage travel trailers! You found my fabric...top middle. But that wouldn't be my first choice a second time. Oh, I can't wait! I just got a fabulous scrap pack from Sew Fresh Fabrics. Love it! And happy early blogaversary to you. i seriously favorited the wild thyme bundle last night! i am in LOOOOVE with it! I'm a bit in love with that hot pink bundle ... not my usual thing but it makes me go zing! It all sounds v v exciting ... roll on April 1st! happy blogaversary a little early. i just had mine, 3 years! i can hardly believe that much time has gone by. hard to choose, but I need some solids, so I'm looking at the June Jubilee. Love your fabric bundles! Especially top and bottom right and if I had to choose from those, I'd pick the lemons, I think. Love your 'Fresh Sewing Day' idea too. They are all pretty, but today I'm especially drawn to the "On the road with Kona" bundle. Those solid colors are so soothing. Wow, it is hard to decide which bundle I like the best but I guess it is the one in the lower left corner. I am anxiously awaiting what's next. Waiting to see what you have planned. Congrats! I would choose the cute retro camper fabric with solids. Tough choice, though!